Valentine’s Day is just around the corner. And over at Criteo, we decided to dig into our data to see what 2017 could tell us about Valentine’s Day 2018 sales. You might not be surprised by what people are buying, but seeing just how much certain categories increase was a bit of a shock for us. Cupid’s arrow seems to be pointed at a range of categories – from lingerie and jewelry to flowers and candy. While some shoppers are buying big-ticket items like diamonds, you can always count on seeing a huge spike right before Valentine’s Day itself across a number of products. 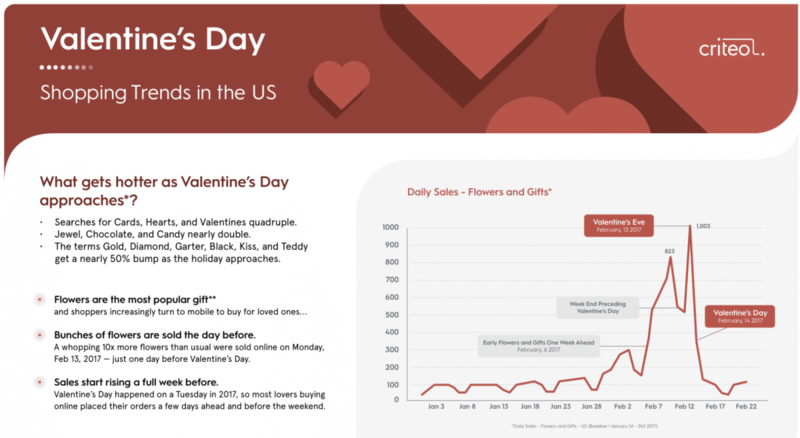 So if you’re interested in optimizing Valentine’s Day sales, it’s important to think about the shopper’s journey as the day gets closer. Planning ahead and launching a marketing campaign a few weeks out can help capture additional impressions, conversions and sales. Here are four ways to really make an impact on Valentine’s Day 2018 sales this season, from first search to the ultimate moment of purchase. 1. Make sure your campaign fits the distinct purchase cycles (and searches) of the day. Whether it’s a month out or the weekend before, you can use a retargeting tool to maintain competitive CPCs throughout the Valentine’s Day 2018 sales cycle. Even if they don’t buy right away, shoppers who visit your site could be doing research for a later purchase. Retargeting helps drive them back to the site by continuing to show them personalized offers as the day draws near. 2. Be in market early, and increase your efforts as the big day approaches. Valentine’s Day 2018 is going to be competitive, so you should ramp up your efforts early enough to reach shoppers in high-consideration categories like jewelry. You may want to run uncapped retargeting campaigns on key days to capture last-minute shoppers who buy gifts like flowers and chocolates. Make sure that you have high brand awareness on search results and cart pages across any potential shopping destination. A commerce marketing solution like Criteo Sponsored Products can help you gain that kind of visibility. 3. Optimize last-minute purchases for mobile sales. There’s no downplaying how important mobile shopping has become, especially when it comes to those last-minute purchases. As our data has shown before, mobile shopping is on the rise around the world, so be sure your strategy is optimized to take advantage of these purchases. Gifts like flowers and chocolates are often a more spontaneous, last-minute decision. They should be on responsive landing pages that make it as easy as possible to convert. 4. Connect online and offline data sources to create the most relevant ad experiences. In an age when people are being inundated with digital noise, personalizing content — what shoppers see, where, and when — is key. And it starts with data. A shopper may begin a search for a necklace on his laptop. Or maybe he visits the store and browses on his smartphone. By connecting your offline shopper emails to an online CRM — and matching those audiences — you can ensure that you deliver personalized offers to shoppers at each touchpoint in their journey. Our research shows that shoppers start considering Valentine’s Day purchases a few weeks out. But that doesn’t mean they’re buying right away. We know that three out of four shoppers are omnishoppers, constantly switching channels and websites to find the best deal. By building an effective retargeting campaign, you can make sure that you don’t lose those potential customers when they leave your site and visit somewhere else. That way, as the big day approaches, you can stay in touch for when they’re ready to make that purchase. 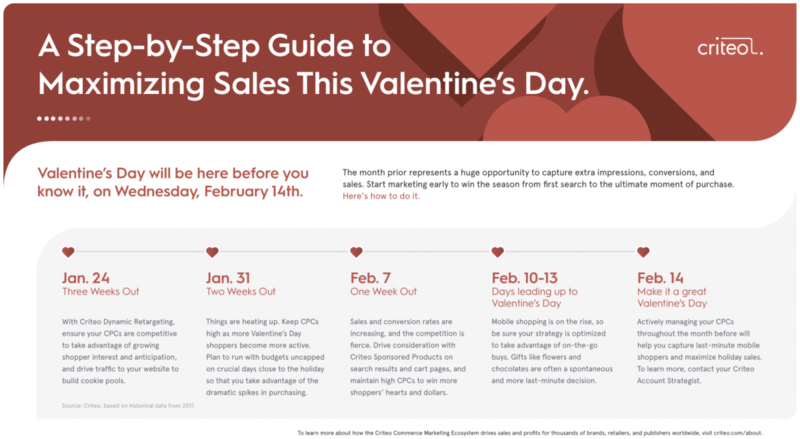 Learn how to make the most of your marketing efforts with the Valentine’s Day timeline below, and download more insights here. *Criteo Sponsored Products retail network data is compiled in aggregate from sales figures from some of the largest retailers globally. The weeks of 1/15 – 1/28 were compared with the weeks of 1/29 – 2/11/2017 to form this analysis. **Based on Criteo Data from a representative set of retailers from Flowers and Gifts category. Jan 1-31 = 100.